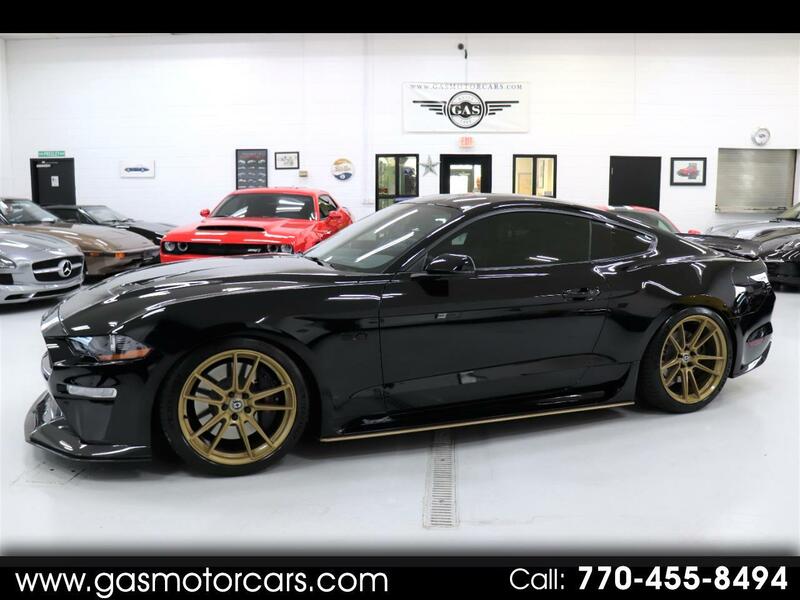 ONE OF A KIND CUSTOM 2018 MUSTANG GT. SOLD AT BARRETT JACKSON LAST YEAR FOR $250K PLUS COMMISSION FOR CHARITY. THIS CUSTOM ONE CAR WAS BUILT TO COMMEMORATE THE LAUNCH OF THE LAS VEGAS KNIGHTS HOCKEY TEAM. IT WAS A NO EXPENSE BUILD FEATURING A ONE OFF CUSTOM SHELBY RACING POLISHED SUPERCHARGER. THE MOTOR MAKE 775 HP. IN ADDITION IT HAS CUSTOM HRE WHEELS, CUSTOM CARBON FIBER BODY KIT, 3:55 REAR END, CUSTOM SUSPENSION, AND MUCH MORE. THE FACTORY SPECS ARE GREAT WITH THE RARE AND DESIRABLE FACTORY PERFORMANCE PACKAGE WITH FACTORY SPORTS EXHAUST. GAS MOTORCARS INC IS A FAMILY OWNED AND OPERATED DEALERSHIP LOCATED IN MARIETTA, GA. WE ONLY SELL VEHICLES OF THE HIGHEST QUALITY. FINANCING AVAILABLE FOR QUALIFIED BUYERS. WE CAN SHIP WORLDWIDE. WE SHOW VEHICLES BY APPOINTMENT ONLY. WE CAN TAKE TRADES.